Welcome to USE Shelving and Racking Ltd. We are suppliers of new and used pallet racking, warehouse shelving and heavy duty storage equipment. We buy in bulk and distribute across mainland UK from our own warehouse so we can offer the lowest prices in the UK on most current makes including Dexion Speedlock and P90, Apex, Link XL, Redirack, Planned Storage, HiLo Rackplan and more. Get in touch using our online chat or call us free on 0800 612 3210 or 0330 660 0321. Please leave a message if we are busy and we’ll get back to you as soon as possible, usually within 5-10 minutes. 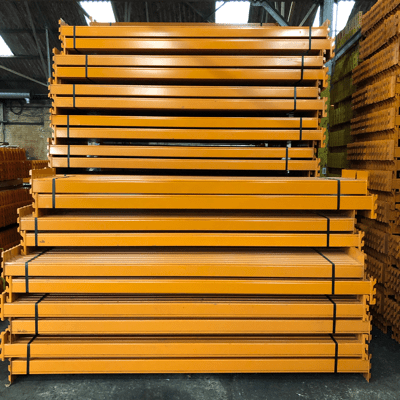 We specialise in used pallet racking and always have huge stocks of all leading manufacturers (Dexion, Apex, Link 51, Redirack, PSS etc) in a wide range of sizes and duties. Column guards, rack end barriers, pallet support bars and timber decking are all available to complete your warehouse racking installation. We also keep large quantities of new longspan shelving in stock, for hand loaded storage of non-palletised goods. This strong and versatile system is also available in many different sizes and can be ready for dispatch in as little as 2-3 working days. With heavy duty shelving up to five metres high, our range of warehouse steps are a safe, mobile and robust way of accessing your stock. This very popular range has variants suitable for all office, storage and warehouse environments, with a number of design options and modifications available. Our extensive range of steel lockers provide a strong and secure storage solution for many environments such as cloakrooms, changing rooms, golf clubs and schools. Manufactured in the UK with many colours, sizes, styles and locking options. We deliver to any UK mainland address, so whether you are in Edinburgh, Manchester, Norwich or Bristol we can deliver what you need at a great price. If you are looking for industrial racking or any other warehouse storage equipment, call us now on 0800 612 3210 with the details or send us an enquiry form and we will reply to you quickly. If you are looking for great quality used Dexion racking at low prices then we can supply you with exactly what you need. We have huge quantities in stock, in a wide variety of sizes and duties to suit all warehouse storage requirements. We have heavy duty upright frames available in all heights from 2000mm to 10000mm. Frames can be braced to standard 900mm or 1100mm depths and older, imperial measurements such as 914mm (3 foot) or 1067mm (3ft 6in) can also be supplied on request. We have thousands of beams at 2700mm long, with a load capacity of 2 tonnes UDL. This is by far the most requested size and is suitable for both uk pallets and euro pallets. We have many other beam sizes available and can always find a suitable solution for any pallet storage requirements. If you need to use some or all of your used pallet racking as hand loaded shelving, we can also supply open or close boarded timber decking. We can even supply decking to span runs of back to back warehouse racking for use as carpet racking. 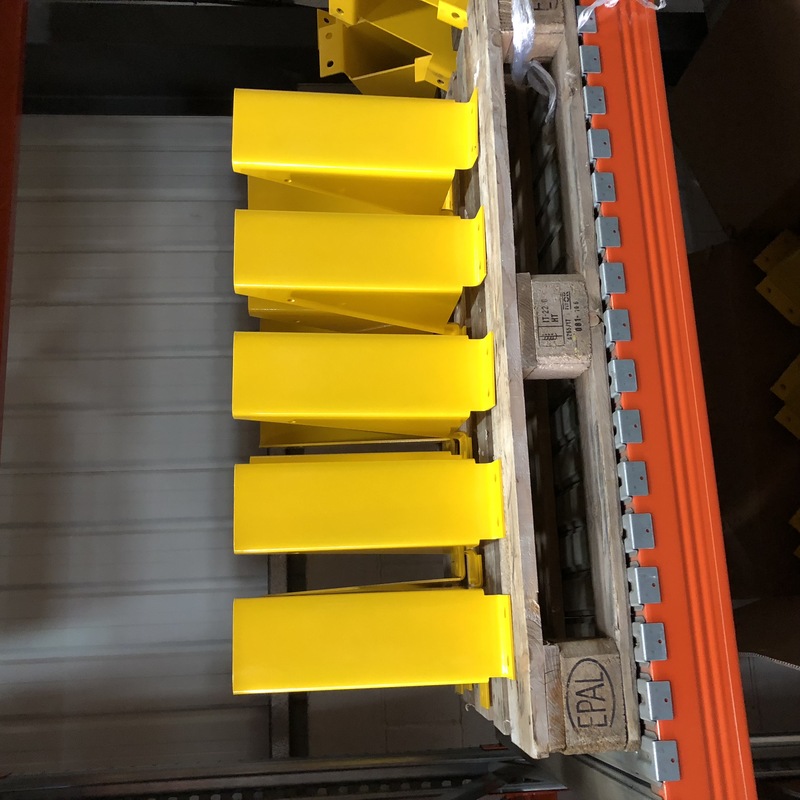 To complete your used racking installation, column guards and barriers are a relatively cheap way of preventing potentially expensive damage to your pallet racking. We always have these in stock and they are supplied with fixing bolts as standard. As well as Dexion, we also stock all leading manufacturers of pallet racking, such as Apex, Link 51, Redirack, and PSS, so give us a call and we will do all we can to ensure that you get what you need at a great price. We have part loads currently scheduled to go to Manchester, Newcastle, Essex and Gloucester in the next couple of weeks, so if you are near to these areas get in touch now and we will give you a great delivered price. Call us on 0800 612 3210 or send us your details on an enquiry form and we will reply to you quickly. If you are looking for a strong and versatile hand loaded shelving system, then our longspan is what you are looking for. Like a scaled down version of pallet racking, longspan shelving has upright frames and horizontal beams, but the beams have a Z profile which creates a lip to hold the chipboard shelf in place. Support bars mean that shelves can hold from 430kg to 1075kg UDL (depending on the beam size), making this range of shelving strong enough for most warehouse environments. The upright frames are 2000mm to 5000mm high and 400mm to 1200mm deep. They are supplied assembled, with footplates attached and with fixing bolts and shims included. Beams are available from 950mm to 2700mm long and are supplied with beam locks. This system can be used for tyre racking, archive storage, picking levels, office shelving or in any environment where strong hand loaded shelving is required. Our longspan shelving is made by AR and we have huge stocks ready for dispatch in as little as two working days. If you require shelving from a different pallet racking manufacturer (Dexion, Link 51, Apex, PSS etc) please get in touch and we will provide the best price and lead time. We deliver across the UK every day, so whether you are in Glasgow, Leeds, Bristol or Southampton we can give you a great delivered price. Call us now on 0800 612 3210 or use the enquiry form to send us a message and we will reply to you quickly. Our experienced and helpful team will help you find the right storage solution for your business. Happy New Year to all our customers and suppliers, we hope you have a happy and successful 2019. We start the new year in a great position, with huge quantities of quality used pallet racking in a wide range of sizes, duties and manufacturers. Our stocks are particularly good in used Link 51 pallet racking, but we also have plenty of Apex, Dexion, Redirack and PSS warehouse racking. We also have large amounts of new pallet racking available for quick dispatch. If you need other items to go with your pallet racking, our extensive range of accessories are in stock and ready to ship in as little as 1-2 working days. We have column guards, rack end barriers, timber and wire mesh decking, pallet support bars, fixing bolts, beam locks and much more. We have installations already booked in Teeside, Leeds, Crewe and Kent, so wherever you are in the UK, we can supply, deliver and install your pallet racking or longspan shelving. Call us now on 0800 612 3210 to place an order or to discuss your options. Alternatively you can use our handy enquiry form to send us as many details as you have and we will reply to you quickly. We are always looking for medium to large parcels of good quality used pallet racking to buy. If you have warehouse racking or longspan shelving that you no longer require, please get in touch now for our best price. We are particularly looking for leading manufacturers, such as Dexion, Link 51, Apex, Redirack and Planned Storage but we will consider all other types of industrial racking of the quality and quantity is right. We are currently taking down a warehouse full of pallet racking in Stockport and are looking at other offers in Leeds, North London and Bristol. So wherever you are in the UK we can arrange dismantling and transport of required. Please give us a call on 0800 612 3210 with the sizes and quantities you have for sale. Alternatively, you can send us the details using our enquiry form and we will get back to you quickly. We have just taken delivery of a couple of very large parcels of quality Link 51 used pallet racking in a range of sizes and duties. Upright frames are in standard depths of 900mm and 1100mm, but other sizes can be supplied on request. All our pallet racking frames are supplied assembled and with footplates attached. We have thousands of racking beams available, with the greatest number in 2250mm, 2680mm, 2700mm and 3100mm clear entry. All our beams are supplied with beam locks. 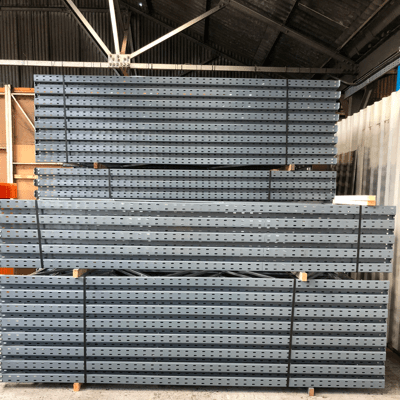 We also have good stocks of column guards, barriers, pallet support bars and both timber and wire mesh decking to complete your industrial racking system. Our helpful team are available now to take your order or to offer you as much advice as you need to make the most of your storage space. We can also deliver to any UK mainland address, so whether you are in Chester, Bradford, Kent or Gloucester we can get your order to you fast and for a great price. Call us now on 0800 612 3210 or send us a message using the enquiry form. 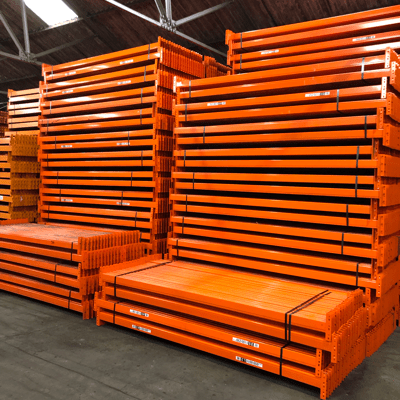 The weather may be getting cold, but our phone lines are hot with enquiries about the huge quantities of quality used pallet racking that we currently have available. We have recently taken delivery of large amounts of Link 51, Apex and Dexion racking and our stock of other leading manufacturers, such as Redirack and PSS remains strong. We have large orders of warehouse racking going to Glasgow, Sheffield, Hampshire and Bolton in the next few weeks, so if you have some additional parts that you need, please get in touch now and we will try to fit them on scheduled wagons for a great delivered price. The diaries of our installation teams are filling up fast, so if you would like your racking to be installed by fully qualified, SEIRS accredited pallet racking engineers, let us know what you need now. Call us on 0800 612 3210 or use the enquiry form to send us your details and we will reply to you quickly. We specialise in second hand pallet racking and have large quantities in stock in a wide variety of sizes duties and manufacturers. We also hold stock of a huge range of pallet racking accessories and protection, which are ready for dispatch quickly and to any UK mainland address. It is important that you protect your warehouse racking uprights from costly forklift damage and our column guards and tubular barriers are a simple and easily installed way of doing this. If your pallets need supporting on the racking then we can provide pallet support bars, timber decking or wire mesh decking. The decking options can also be used for picking levels or storing hand loaded and non-palletised goods. We can also supply warehouse labels, rack identification, beam locks, fixing bolts and load notices. Call us now on 0800 612 3210 with a list or what you need, or to discuss the options available to you, and we will give you a low price quote and short lead time. Alternatively you can send us an enquiry form and we will reply to you quickly. We are currently taking delivery of huge quantities of quality used pallet racking, which means we can give you a great price for your warehouse racking requirements, no matter how big or small the order. Our stocks of Dexion, Link 51, Redirack and Apex are very good with large quantities of beams in standard sizes such as 2700mm and 2250mm. Upright frames are available in 900mm and 1100mm depths, or they can be adjusted to bespoke sizes on request. We can also supply a wide range of racking accessories, such as column guards, timber and wire mesh decking, pallet support bars and fixing bolts. Call us now on 0800 612 3210 to discuss your requirements or place an order. Alternatively you can send us a message on the enquiry form and we will reply to you quickly. We have deliveries going to Edinburgh, Liverpool, Lincoln and Somerset in the next week, so we can always give you a great delivered price wherever you are in the UK.